While many U.S. supermarkets continue to stick their heads in the ground when it comes to potential GMO dangers, Germany’s top supermarkets (behemoths when it comes to European retail food supply) are delivering a big blow to biotech. The German poultry industry will now be forced to once again use non-GMO feed. 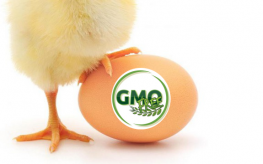 Just last Thursday it was announced, with broad consensus, that starting from January 1st 2015, the German Poultry Association (ZDG), will have to stop using GMO feed for both egg and poultry meat production. From this date forward, food retailers will only accept poultry that has been raised on GM-free feed, and milk and eggs which come from cows fed GM-free feed. This will help force GMO distribution companies like Monsanto to look elsewhere for their shady business partners. Furthermore, last February, the ZDG unilaterally declared that it would stop using GM-free animal feed, following similar moves by other associations in England and Denmark. The ZDG alleged that is was making the change due to a shortage of GMO-free soya, the risk of contamination, and an associated legal uncertainty. Germany once enjoyed an entire decade without GM-fed livestock. Following intimate consultation with Brazilian authorities, German supermarkets have realized that the reasons given by ZDG do not stand up: there is obviosuly enough Brazilian GMO-free feed in the system to supply Europe’s needs. The ZDG has reacted to the pressure from the supermarkets and consumers by proposing to the retailers to set up a working group to discuss options, but it is clear that both retailers and consumers have their minds made up. They demand a completely GMO-free feed supply chain in all animal feed sectors, including dairy, pork, and beef as a next step that is to follow relatively soon. Keep up the great work, Germany! !